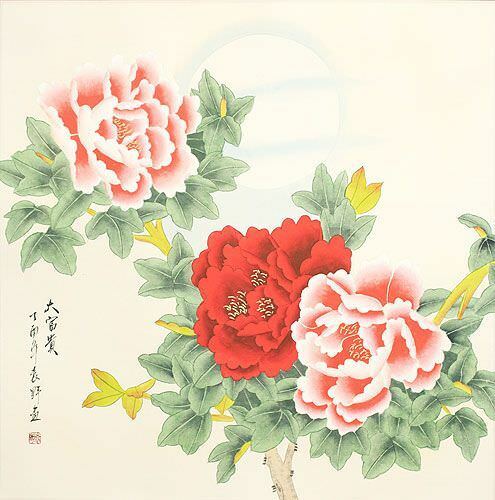 Buy Flower Chinese Calligraphy Wall Scrolls! 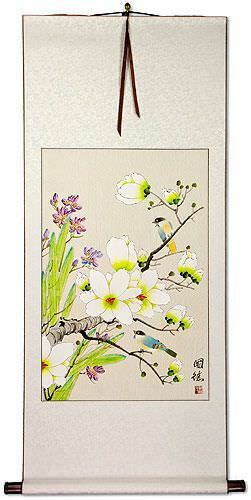 We have many options to create artwork with the Chinese characters / Asian symbols / Japanese Kanji for Flower on a wall scroll or portrait. 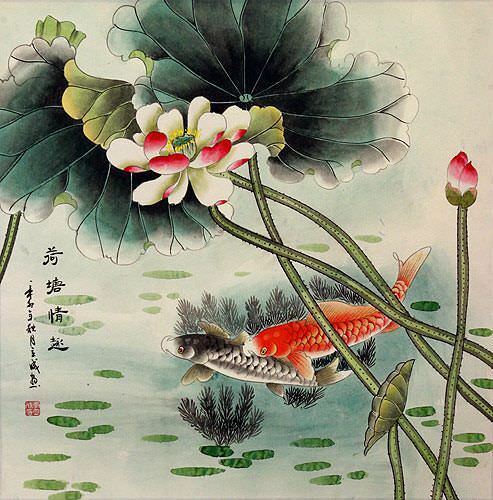 If you want to create a cool Flower Asian character tattoo, you can purchase that on our Chinese and Japanese Tattoo Image Service page and we'll help you select from many forms of ancient Asian symbols that express the idea of Flower. 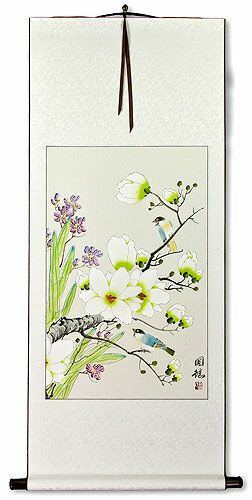 櫻 is the single-character (short) way to write "cherry blossom" or "cherry tree" in Chinese and traditional Japanese Kanji. There is an alternate version of this character, which has become the standard for Japanese Kanji. If you want this version, instead of the one shown to the upper left, please click on the Kanji shown to the right instead of the button above. Although this is an alternate form in Chinese, most Chinese people will think this is just the Japanese version (Chinese people don't necessarily know the history and all alternate forms of Chinese characters from the past). Therefore, this version shown to the right is best if your audience is Japanese (though most Japanese will recognize the form shown in the upper left). 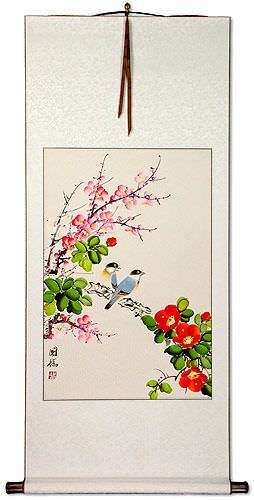 櫻花 is how to write "cherry blossom" in Chinese and traditional Japanese Kanji. The first character means "cherry" or sometimes "cherry tree." The second character means "flowers" or "blossoms." Oddly, my Chinese dictionary also defines these two characters as "Japanese oriental cherry tree" or "Oriental cherry blossom." However, the first character is the only one that means "cherry," so it can refer to any cherry blossoms in the whole world (not just those in Asia). There is an alternate version of the first character, which has become the standard for Japanese Kanji. If you want this version, instead of the one shown to the upper left, please click on the Kanji shown to the right instead of the button above. Although this is an alternate form in Chinese, most Chinese people will think this is just the Japanese version (Chinese people don't necessarily know the history and all alternate forms of Chinese characters from the past). Therefore, this version shown to the right is best if your audience is Japanese (though most Japanese will recognize the form shown in the upper left). 紫羅蘭 is the Chinese title for the flower we refer to as the violet in English. Some may call it the gillyflower. 菫 is the Japanese Kanji for violet. This can refer to any flower of genus Viola, esp. the Fuji dawn, Viola mandshurica. This can also be the Japanese name Sumire. 菫 is also commonly written in Katakana as スミレ. 菫 is a variant of Chinese character 堇 (jin3) which has the same meaning.